Companies used to pay the city for the recyclable materials gathered from residents. Now, the city may have to pay companies to take them after China imposed new restrictions on recycled material. The city sends about 80 percent of its recycling abroad. Most has gone to China. Unbeknownst to most people, about half of San Diego’s recycled material is sent across the ocean to China. Now, that’s a problem. China no longer wants all of it. Unless city officials can quickly figure out another way to recycle material, some recyclables could end up in landfills. In recent months, China imposed new restrictions on recycled material coming from abroad. For the past few weeks, it’s effectively blocked all recycled material sent by the United States. 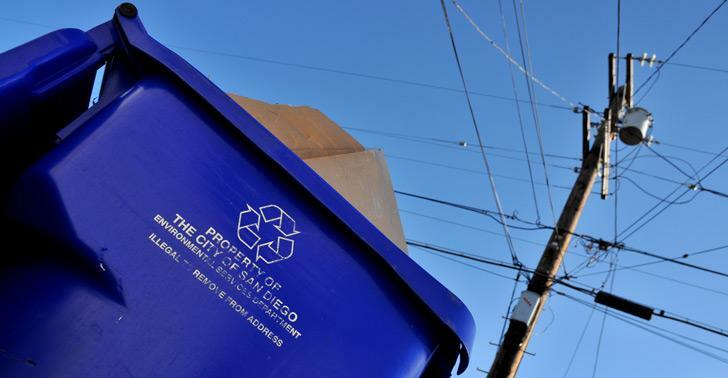 That is throwing recycling programs across the country into disarray, including San Diego’s. The city sends about 80 percent of its recycling abroad. Most goes to China. The city budget may take a multimillion-dollar hit, too. The city, which used to get paid to send companies its recyclables, may now have to pay companies to take recyclables. At first glance, it seems absurd the city would pick up paper, plastics and metals from curbside recycling bins, sort through it, bale it and then put it onto ships to send across the Pacific Ocean. Yet, that’s a sign of the times. Manufacturing happens in China, not the United States. China sends ships full of goods here. Unless America sent back recyclables, we’d have trouble filling the returning ships with anything at all. “They would just be going back across the ocean empty,” said Ken Prue, the city’s recycling program manager. China uses the recycled material to make new stuff. Lately, though, officials there have wanted to make their recycling process more efficient. Every greasy pizza box makes the rest of the paper harder to recycle. So, the Chinese have gradually increased their import standards. Before, China allowed 2 percent of recycled paper to be contaminated. Now, it wants less than 1 percent to be contaminated. In total, Chinese recycling policies could cost the city $5.1 million, though city officials are trying to negotiate a better deal. Now, IMS and Allan Company are asking the city to pay them $1.1 million to take the recyclables, according to a May 24 letter Mario Sierra, the director of the city’s Environmental Services Department, sent the City Council. That’s because the recycling companies must hire workers, slow down sorting lines and store material for longer periods of time until it can be sold. The past few weeks have been particularly rough because China has effectively frozen all imports, though that restriction is easing and is expected to soon end. Still, customers who have to pay for trash service may see higher bills. “If things stay the way they are, I would say within the year we will have to start increasing rates for recycling collection,” Snyder said. In some cities, recyclables are already being sent to landfills, and one Oregon county has ended its recycling program. Prue said so far no curbside recyclables have been dumped into landfill. He said right now, the best thing that city residents can do is only try to recycle stuff that is clean and can be recycled. “We need to continue to recycle and the big thing is put the correct materials in the bin, so it’s the clean materials,” he said. There may need to be a broader reconsider of the whole recycling system, though.